This blog series has been dedicated to introducing you to the concept of Stewardship. Stewardship takes on many forms: time, family, faith, talent, prayer and, finally, treasure. In the last post, I described Stewardship as it relates to prayer. 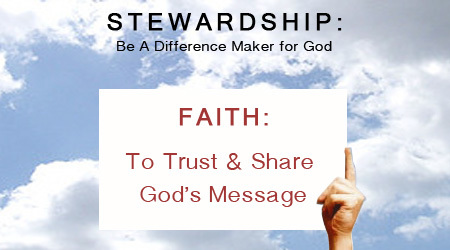 In this post, I would like to introduce you to the concept of Stewardship as it relates to faith. It has been my experience that many people are just too afraid or uncomfortable to talk about their faith. I can empathize. I, myself, was caught up for many years, struggling to talk about faith and my difficulties with the tenets of Catholicism with anyone. I was, perhaps, conditioned not to question authority, but instead to accept what was told to me blindly as truth. I was a coward and did not pursue a relationship with Christ. When I look back at my cowardliness, I am relieved that, at some point, I made a turn toward the truth. That point was when I heard for the first time the clarity of the salvation message from Pastor Powell at NorthRidge Church. Many devout Christians will argue that it was not the pastor speaking, but the Holy Spirit. I agree that the Holy Spirit does, in fact, breathe life into those who are ready to receive. Sometimes though, we are not ready to receive for many years, and sometimes, because of our upbringing, it is much sooner. There really is no recipe for success; it is a God thing, a preordained date and time that you will become a faithful servant of Jesus. I have learned in these past eighteen months that many denominations carry the same message, that acceptance of Christ as your Savior is your ticket to eternal security. What is my advice to those who seek faith? Don’t confuse the message with what man has added to it. Find Christ. Find a like-minded Bible believing Church that fits your personality and style of worship, connect in a life group of other Bible believers and serve in your community as an ambassador for Christ. That, my friend, is being a Steward of your Faith. Of course, these are my opinions. And my opinion means nothing to the way you decide to be faithful. What are you going to do to be a good Steward of your Faith? Post a few notes here; we would love to know.